This post is intended for TO (*Toddlers Only). If you have hair anywhere on your body other than your head or have ever eaten a fig, please stand up and walk away. Go do something you love like wiping down counters. 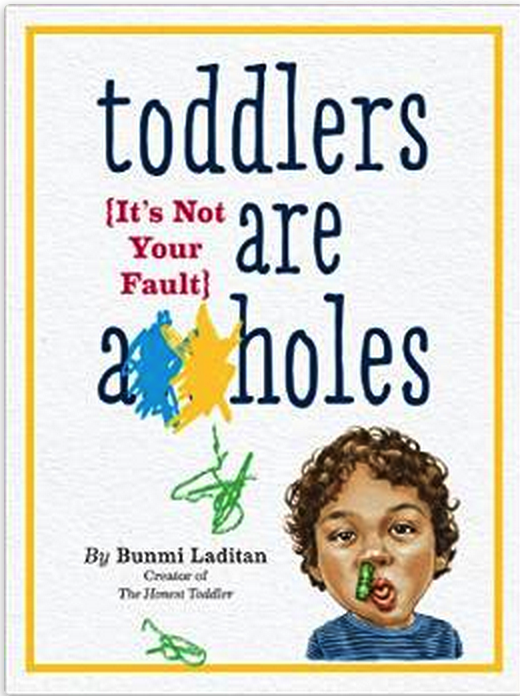 Toddlers, now that we're alone I have something important to discuss with you. You already know that it is impossible to love more than one person at a time. That's why when parents hug or show affection it feels like a slap in the face because it is. I have some disturbing news to share. Your parents don't just hug during the day, they hug at night, too. During the time you need them most, they hug. Most children know that the night is a terrible time. Night is when dinner is presented, owls hunt, teeth are forcibly washed as if you haven't been soaking them in nature's toothpaste (saliva) all day, and you're expected to lie down for hours. Now you can also add to your list of sadness that the twilight hours are when mommies and daddies all over the world hug until they forget you even exist. Last night I witnessed these shenanigans for a brief moment and could not believe the lengths they went to to conceal their hugging practice. They even do it under a blanket. I invented under the blanket. They just took my idea and ran with it. I love hugs, too you know. Was I invited or notified? Absolutely not. While I was in my bed having nightmares about swiss chard (it's real) they were bonding as a family. What I don't understand is why there were candles but no birthday cake as the two go hand in hand. I know the power wasn't out because Usher's Greatest Hits was playing. You got it, you got it bad. I know this hug was daddy's brainchild as he seemed particularly agitated when I tried to make a baby sandwich under the covers. I've had it with his selfishness and will be breaking three of his personal belongings come morning. Then we can all move on from this and enjoy hugs they way they were mean to be shared: with me. One of the dangers of hugs is that they are a gateway to a disease called sibling infants. I know this because several of my friends are infected and it is fairly simple to put two and two together. <-- I hope you saw what I did there with "two and two together." This is no laughing matter though. I just want you to notice what I did. Now that you've seen it pull yourself together. Enjoy it one more time if you need to but that's enough. While I'm not a (recognized) scientist, I know how special time leads to infant sibling disease. Put down your LeapPad because it's not helping you read you're just looking at the lights. Pay attention. WHEN A MOMMY AND DADDY LOVE EACH OTHER VERY MUCH THEY HUG ALONE IN THE BIG BED WHILE THEIR SWEET BABY LIES SHIVERING IN A LITTLE BED BECAUSE THE BLANKET CAME OFF AGAIN. THIS YOUNG BEAUTIFUL CHILD IS PROBABLY ALSO HUNGRY BECAUSE DINNER WAS A DISASTER AND THEREFORE INEDIBLE. This is where it gets more complicated. Go get a snack cup of orange slices in corn syrup and come back refreshed. AFTER IGNORING THEIR SWEET BABY'S REQUEST FOR WATER BECAUSE THEIR CHILD IS DEHYDRATED FROM CRYING, A CENTAUR FLIES THROUGH THE WINDOW AND GIVES YOUR MOMMY AN ACORN. SHE EATS THE ACORN FAST LIKE IT'S THE LAST DOVE BAR AND A CHEMICAL REACTION IN HER STOMACH BEGINS TO TURN IT INTO A BABY. EIGHT YEARS LATER, A BABY WILL PUNCH ITS WAY OUT OF HER LEFT LEG. THAT BABY WILL THEN LIVE WITH YOU FOREVER. I know this is hard to hear. Special time might be fun for parents but it is dangerous. As the ninja of your family it is your obligation to step in. Use pee pee if you have to because that's what it was invented for: violence. Good luck. Failure is not an option unless you want to go from #1 to #2. <-- I did it again. Number two like poo poo. Did you see that right away or did I have to point it out. Either way you're enjoying it now. Start the sentence again with poo poo in your mind. You're going to feel like caca once there is a sibling infant in your house because it will need so much assistance with everything. Infants come into the world bringing nothing to the table and are takers. You'll be basically raising yourself.